-An instant speed damage effect with rebound (although this is highly unlikely as I don't think any red cards will have rebound in the new set based on the storyline). -A possible protection effect from a player or with artifacts included (much like apostle's blessing, but at a one mana cost. -A bounce effect for permanents/creatures. This would be a little linear unless it's permanents but it would be interesting. Please feel free to post any card ideas that you think would help this deck! Thanks for looking! Well we just got a huge upgrade to the late game with Narset Trancendent. I will be testing her all week and will post with my results but I think our deck is a perfect fit for her. Let me know what you think. With the original goal of swinging unblocked and with creatures that are low power to start have you considered Break Through the Line, Writ of Passage, and a few other tricks. I skipped to the bottom after the first like 10 posts so things may have been covered. Those are some great ideas. I think a really great list could be made with Break Through The Line. Especially with Kiln Fiend and Geist of Saint Traft. I have considered break through the line, but haven't tested it yet. Writ of Passage looks awesome. I had not considered it yet, but I will definitely be testing with it to see how it works out. Great idea. I would love to hear some of your other ideas or see what kind of deck list you come up with. I wanted to make the deck competitive in the current meta, but there are definitely more aggressive versions of the deck that can be made. I am currently testing Outpost Siege at the top end for card advantage as I don't think Narset Transcendent is right for the tempo version of the deck. I am also working on a Mentor version of the deck with Narset in it. I would love to hear more of your thoughts and I will give write of passage a try. Thanks for posting and thanks for the great ideas! I think you're right on Narset Transcendant. She really wants to be in a nearly creatureless deck to get the most use out of her. I was trying to see what she'd play like in the delver shell but I'm liking the idea of mixing her into token decks more. She's a card that plays better on T5 or later unless a serum visions was played and you know the +1 will draw something. I agree Jay. She was great when we were ahead, but felt just like a win more card in this build. She will perform much better in a more controlling build. I think Narset Transcendent and Monastery Mentor are a match made in heaven. Outpost Siege has been performing very well. I have always loved Chandra, Pyromaster as a top end option, so having an enchantment based similar effect is a great way to make sure the effect sticks late game. If a decent card draw card (rest in peace Treasure Cruise and Dig Through Time) is printed then it will probably replace Outpost Siege and/or Chandra. We will see. The deck is always evolving. Thanks again for the input! I'll give some more in depth thought and try to throw out some more things to test. I ran a lot of unblockable for Ninjitsu, Infect, and current Jeskai decks. The reason I like Break Through the Line is the synergy with what all the creatures do... GROW from a much lower base state that just doesn't stay. Being an enchantment does mean when you cast it it will trigger Prowess which is good, but not the Instant/Sorcery only guys. The fact that it grants haste is fantastic. I think your definitely right. Break Through the Line can really be exploited in this type of build. I will test it in my build in place of the other unblockable spells and also try to brew a similar deck built around the card. It would probably have more Kiln Fiends and no Shu Yun, Chandra, Outpost Seige. It will be a more aggressive version of the deck. You mentioned Ninjitsu and I have often wondered if I should try Ninja of the Deep Hours for card advantage. I think it's worth a try, especially if no card draw spells are created any time soon. I still hold out hopes for a draw spell with rebound. I also agree that haste is totally underrated on utility cards such as enchantments. I have won countless games by giving a creature haste with Slayer's Stronghold and attacking. Thanks for posting and keep us posted if you test your ideas. REBOUND IS FINALLY HERE !!!! 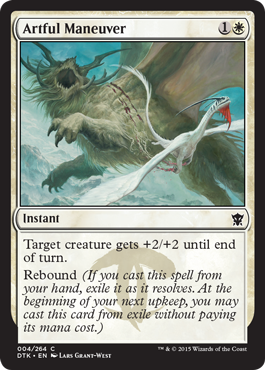 I can't wait to see some of the great new Rebound spells, and this first one is AWESOME already...making your Shu, Yun 6/5 (doublestrike if triggered) and your Monastery Swiftspear 4/5 for two straight turns is just great...especially at instant speed. I can promise I'll be testing it immediately! U, instant or sorcery (of course I'd rather have instant, but I'll take a sorcery), draw a card, Rebound...it's that simple! Yeah...but the white rare you mention (and the other blue one that is a high casting cost) are probably not quite playable in modern I understand what you meant though. I'm in the same boat...hoping they provide us at least one pushed rebound spell; but also not holding my breath...just keeping my fingers crossed!!! The Break Through the Line talk got me to thinking/looking for unblockable affects that can be continually triggered. I had the idea to use Thassa, God of the Sea in the past, but never actually tested the idea. So far it has been testing great. It gives us a never ending unblockable ability, but on top of that the scry ability is SUPER powerful in this deck. With this being an indestructible enchantment and Outpost Siege also being an enchantment, the top end of the deck is very hard to remove/answer. In the several games I have had Thassa and/or Outpost Siege in play I can bury the opponent under card advantage as well as always draw gas. I really like the Thassa/Siege combo at the top end. I will keep testing and will post some in-depth testing results this weekend. I wanted to let anyone who is trying the deck to give this combo a try. I think it would work great in any Delver variant as well as the top end of the deck if you are playing delver as well. On another note, we get the remainder of the Dragons of Tarkir spoilers tonight. Hopefully we will see some great rebound spells that can bring this deck idea over the top! I am keeping my fingers crossed for a draw spell, a protection spell from artifacts, or a burn spell (unlikely). Really just any cool instant speed rebound spell would be nice to add to the deck. I also wouldn't be surprised at all to see a Distortion Strike reprint. I was also looking forward to Tiagam possibly having an ability that gives spells rebound, however, rumor has it Taigam will not be getting his own card in the set and will be saved for later years if/when Tarkir is revisited. That stinks, but a creature with a possible rebound ability is still possible, but is also unlikely at this point. Everyone keep their fingers and toes crossed, make a wish, throw a penny in a fountain, find a penny, say a prayer, or do whatever you can so there is a least one modern playable rebound spell spoiled tonight :). Wow. The rebound cards were underwhelming at best. This deck is still awesome, but WOTC really missed a shot to add another great rebound card. I'm a little surprised that the rebound cards are so highly costed. Anyways, testing results will be up tonight! HUGE infusion from today's spoils. Including a second protection rebound, another unblockable self buffing dude, a few more handing rebounds. I'm not thrilled about the CMC of those rebounds but at least useful ones. Seraphinwolf- Your right. WOTC printed the correct types of cards for this deck. They printed a pump spell, an unblockable spell (with pump), and a protection spell. They even printed a rebound sleight of hand draw spell. However, because the costs are higher than their predecessors, they simply aren't playable in this version of the deck. With that said they are great options for a budget version of the deck or a standard version of the prowess/rebound deck. I have been testing the card Cerebral Vortex in my sideboard and in the mainboard for card advantage. I have found it to be very good when I switch to a very aggressive deck because it can act as additional card advantage or additional life loss/burn to the opponent to finish them off (if you do it to them on their turn they draw two card and loose 3 life). I think this card could be great in the correct build. I will post some testing/FNM results tomorrow in the afternoon when I have more time. Thanks for looking! I'll be providing my updated list (with testing of some of the new Dragons of Tarkir cards including Anticipate!) I've been testing a TON and found some really cool interactions and cards that make this deck that much better. I'll post all my findings over the weekend. Artful Manuver has actually been somewhat strong in a few cases during testing. Not sure if it an make it due to its 2-CMC; but it has performed better than I expected. Please say you slipped Hidden Spellfist in! I LOVE that card! Good call again Seraphinwolf. I think Elusive Spellfist is being underrated right now and I am testing it in this build. The built in unblockable ability is really cool and right up our alley. I also love that there can be a budget version of this deck. I think with Kiln Fiend and Elusive Spellfist the budget deck will actually be very good. I am going to add a budget version to the primer as well. I will also be posting some testing results soon and a picture of the foiled out deck if anyone wants to see it. Thanks for posting! Here is the newest iteration of the deck. Now that I have tried many different iterations, I have "cleaned" the list up a little to get the most consistent list. This list has been testing great. It has similar matchups to the WUR Midrange list, but gets many more free wins. It also has a much better matchup against Jund/Junk than the WUR Midrange deck because it can attack through a stalled board or burn the opponent out. The sideboard is basically set up to board into a more controlling/midrange version of the deck with cards like Path to Exile, Negate, Engineered Explosives, Counterflux, Spellskite, etc. Another option is that you can side into a super aggressive/burn deck. I prefer the more controlling sideboard, but you could play additional lightning helix, two or more Mantis Rider, Forked Bolt, Boros Charm, etc if you want to go to an aggro deck. Anticipate added another great option for the Jeskai decks, especially the delver variations. The final card I have been testing is Myth Realized. It has been extremely good when it's good and not so good when it's had. I have been testing a slower version of this deck with Narset Transcendent, Ojutai's Exemplars, Myth Realized, and Monastery Mentor that has been testing very well and would suite players that tend more towards the control style Jeskai decks. Let me know what you think. Thanks for joining the disccusion! Also, I don't know if you have seen it yet, but Sam Black wrote an article today on SGC that talks about utilizing rebound in modern. He specifically suggests Emerge Unscathed which is a card we have been playing for awhile. He also focused on Myth Realized which is a card that could definitely fit into this deck. It's always nice to get affirmation that we are onto something that could possibly see play in the future by a pro. I am going to purchase this deck online and try to play some dailies to get a few 3-1 and 4-0 finishes to possibly get the deck a little publicity. I have been working on get the sideboard right lately and am considering getting rid of Counterflux and Azorious Charm. Does anyone have any suggestions for two cards you think fit better into the sideboard. My meta is vary wide so any suggestions are welcome. Let me know if your playing anything similar to this deck or if you have any ideas to make the deck better. Not currently running this in Modern but a Standard similar idea of an unblocked blowout. I believe I mentioned Temur Battle Rage a few times as well as Elusive Spellfist. In this Standard version I patiala focus on having Dance of the Skywise to stack a few spells with Prowess and/or Jeskai Ascendancy to leave one explosive hit. The bonuses stay with the creature from buffs but the base stats become 4/4. So your Seeker, Swiftspear, Spellfist become 4/4 fliers plus whatever has been stacked on that. If you want to keep the other abilities it's simply a matter of stacking the spells so that Dance of the Skywise is played last and resolves first.